Former Watford owner Laurence Bassini says Bolton Wanderers have been saved from administration "at the 11th hour" after he agreed a deal to buy the club. 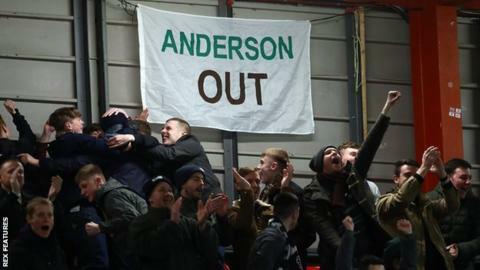 The takeover, which remains subject to English Football League approval, was confirmed by the club on Wednesday. "The priority was to save the club from going into administration," Bassini told BBC Radio Manchester. "Now we have to look to restructure and move the club back up to where it belongs. "We worked very, very hard to get the deal done. It was very close, to going to administration this morning. At the 11th hour, we did it, going through the night." Bassini also confirmed that existing owner Ken Anderson's involvement in the club will end once the purchase is formally ratified by the EFL. "Significant funds" will be made available to pay outstanding wages and long-term creditors, a Bolton statement said earlier on Wednesday. It is the second month in a row that wages have been paid late, while the playing staff applied to the Professional Footballers' Association for help. Wanderers said on Wednesday that "once completion has occurred, all the long terms debts to HMRC and suppliers will be settled". "I am very pleased to hand over ownership of this great club to Laurence, I wish him and all of our supporters the very best for the future," said current chairman Ken Anderson. "There has been a great deal of comment about the failures of the recent takeovers and the reasons for this," said Anderson. "For the record, when push came to shove the buyers simply did not have the cash, despite numerous assurances. As far as l am concerned, it had nothing to do with the creditors being higher than they were told, or what l was demanding personally, as this is simply not the case. "As l have previously stated, l had agreed to accept a lower amount than l actually paid for my shares from several of the potential buyers and even then they wanted and l agreed to defer some of the payment due to me as did the other secured creditors. "The reality is they were probably hoping it would go into administration and they would then acquire it for substantially less, albeit with a points deduction, but a significant saving on creditors."